One food staple that I just cannot live without is bread. Not just any bread, but homemade bread. I love the feel of the soft dough, the smell of the yeast emanating off a freshly baked loaf, and the satisfaction from the overall taste and texture. 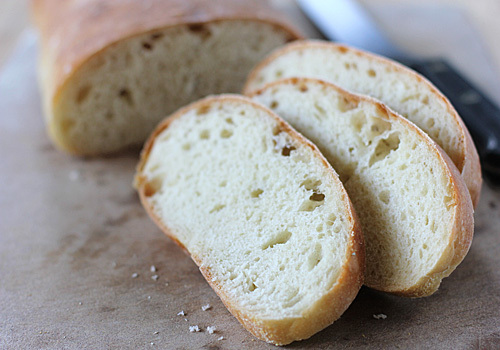 Ciabatta, also known as "slipper" bread, is a white Italian bread. It has an elongated, flat shape with a porous structure and crisp crust. Although popular across Italy and some parts of Europe, ciabatta wasn't widely known of or available in the U.S. until the early 1990s. Its higher profile is a welcome development for this baker! I make ciabatta and use it for sandwiches, panini, stuffing, croutons, and an outstanding garlic bread (recipe to come). I shape it into its traditional long "slipper" form, but I also shape it into rolls. The recipe does require a bit of advance planning because of the biga (the pre-fermentation process used in Italian baking), but you can skip the step and make it all in one day. In fact, the bread pictured was made without the biga and you can see that there is still a significant amount of holes and open texture. Which ever way you decide to make it, it will be good. Make a batch to have warm and drizzled with a good olive oil for dinner, then have some toasted with a good slathering of butter in the morning. *Note- The Biga does require 8-10 hours of rising, but you can omit this step and make the ciabatta in one day. Stir together all of the water (2 cups) and all of the yeast (3/4 teaspoon) until the yeast is dissolved. Then add all of the flour (5 cups) and the salt. Mix and knead as directed in the final dough. Rising and baking times remain the same. In the bowl of a stand mixer fitted with the dough hook, combine the flour, water and yeast. Mix on low speed until thoroughly combined, about 3 minutes. Transfer the mixture to a large bowl, cover with plastic wrap and allow to rise in a warm place until bubbly, airy, and just starting to recede, about 8-10 hours. In the bowl of a stand mixer fitted with the dough hook, combine the flour and yeast. Add the water, biga, and salt and mix on low speed for 3 minutes. Increase the speed to medium and knead until the dough is blended, about 3 minutes more. The dough should be wet and slack. Transfer the dough to a lightly oiled bowl, turning to coat, cover with plastic wrap and let rise until nearly doubled in size, about 30 minutes. After 30 minutes, press the dough with a fingertip; the indentation should not fill in rapidly. Fold the dough over on itself by lifting the edges up and over the center and pressing gently to release the gas. Allow the dough to rest for another 15 minutes. Turn the dough out onto a floured work surface and dust the top with additional flour. Using your palms, gently press the dough into an 8x9-inch rectangle that is an even 1-inch thick. Cut the dough into two 8x4 1/2-inch rectangles. Cover the dough with a kitchen towel and let rest again for 15-20 minutes. Gently free the dough from the surface, trying not to tear or stretch the dough. Transfer the dough to a large parchment lined baking sheet. Gently stretch each piece into a 10x4 1/2-inch rectangle. Cover and let the dough rise in a warm, draft free space for 30-45 minutes. Meanwhile, preheat the oven to 425º F. Bake the ciabatta until golden brown and the crust sounds hollow when thumped on the bottom, about 25-30 minutes. Transfer to wire racks to cool completely. Enjoy! I'm right there with you, no matter what, I would never be able to cut out bread from my diet. It's just impossible :) And the satisfaction of making your own bread is great, hard to explain, but you feel so accomplished! Oooh, that looks great! I know exactly what you mean, I could not cut bread out! It's not something I need all the time, but occasionally, good bread is all I want - and homemade is always the best! First that heavenly garlic bread, and now this beautiful ciabatta!!! I guess I can admit that I'm a bread-aholic, though I've been trying to cut back. These are two of my favorites. I haven't made my own ciabatta in over a year. Hmmm... what if I made the bread then smothered it in garlic butter and grilled it??? Yes, please!!! I just made this bread (using the biga) and it is THE best cibatta I have ever had. 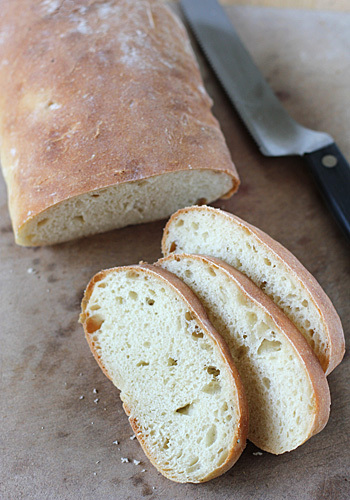 I will no longer make bread w/out using a biga and will use this recipe as my base. I tried this out on a real Italian and he LOVED this bread. We toasted it (after I made it and froze the loaf - the loaves freeze and re-heat wonderfully) and drizzled olive oil on it w/ cheese and hot peppers on top. To die for! Thank you Kim! I am so pleased that you and your family enjoyed it. That is as nice a comment/endorsement that I could possibly receive. Thank you! Looks great. And the biga thing doesn't sound like too much of a chore - you could do it overnight, or put it on in the morning to make bread in the evening. OMG I've been snowed in for 3 days in CT and made this bread today...it just came out of the oven and I had a piece with butter.....YUMMY!!!!!! Thank you for the recipe!! So sorry you have been snowed in, but thrilled you took the time to make and enjoy the recipe!